Let's end 2012 on a happy note. A few days before the end of the year, my sister-in-law's sister got married and she invited my family to the wedding. Well, technically, she got married last summer at the courthouse, but saved the church ceremony and wedding until now. 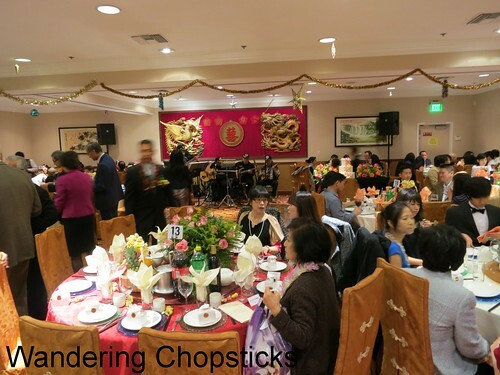 I was curious to check out the banquet menu since my only other dining experience at King Hua was for dim sum. 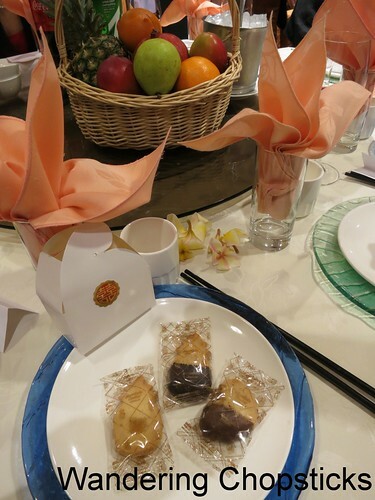 The Chinese reception included a bit of Japanese Hawaiian touches from the groom's side. 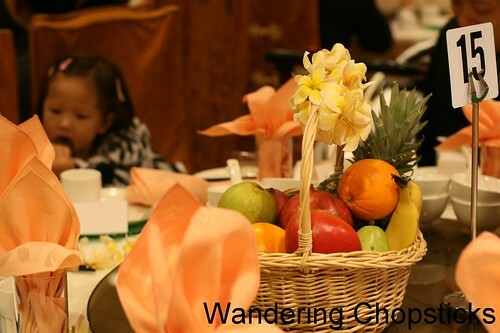 The table favor was a fruit basket with a plumeria lei. 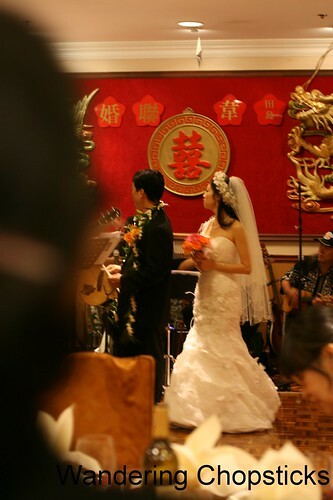 The wedding party all wore really elaborate and different leis that were handmade by a family member too. The niece couldn't wait to scrape off the chocolate from the wedding favors. Hawaiian shortbread cookies with dried pineapple or dipped in chocolate. They were lightly crumbly, slightly sweet, and very yummy. I was seated with my siblings and dad and a few of my sister-in-law's friends. 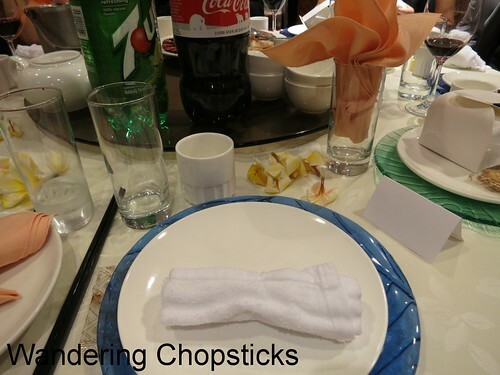 The waiter brought us wet towels to clean our hands before the banquet would begin. 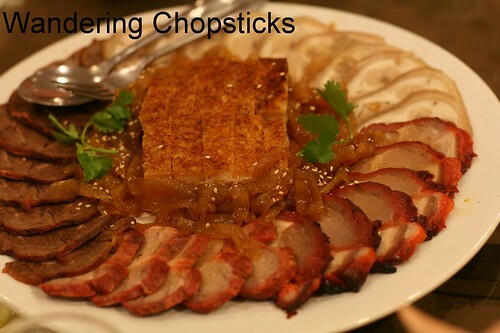 Chinese cold cut platter with steamed meats, headcheese, roast pork, jellyfish, and Char Siu (Chinese Barbecued Pork). Fried shrimp balls wrapped around crab claws. Crispy and delicious. 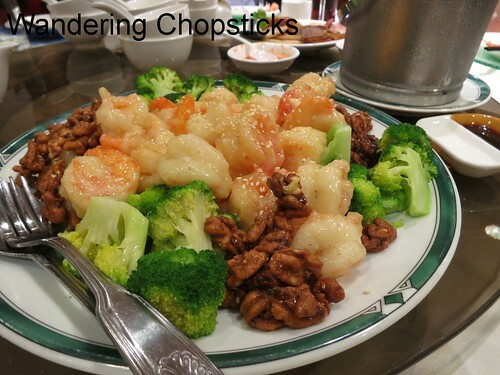 Walnut shrimp with broccoli. 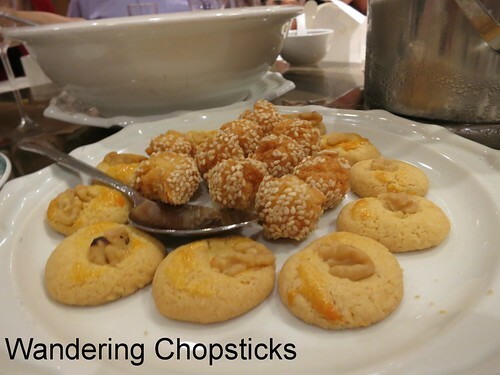 Crunchy sweet walnuts and lightly crisp shrimp. Yum. Crab and egg drop soup. 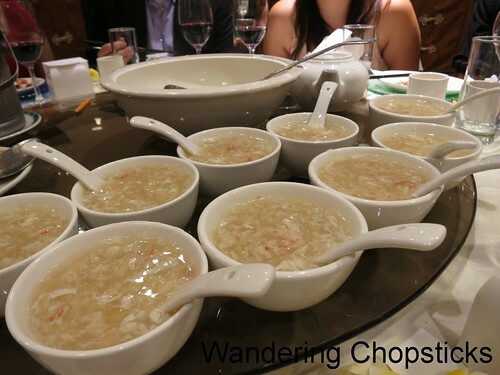 No more shark fin because of the ban in California. Still plenty of flavor because of the crab anyway. 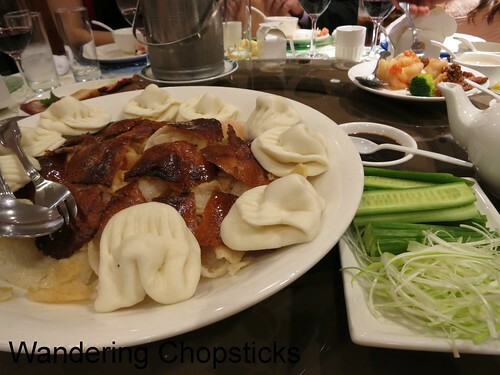 Peking duck with steamed buns on a bed of shrimp chips with cucumber slices and scallion slivers. 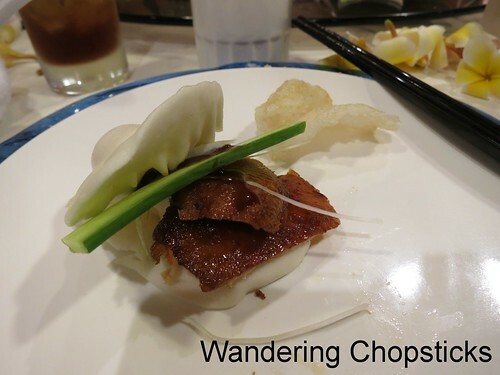 Put a piece of duck skin inside the bun with a slice of cucumber and a few slivers of green onions, drizzle hoisin sauce. Abalone with shiitake mushrooms on stir-fried iceberg lettuce. The abalone and the lettuce are my favorite parts. 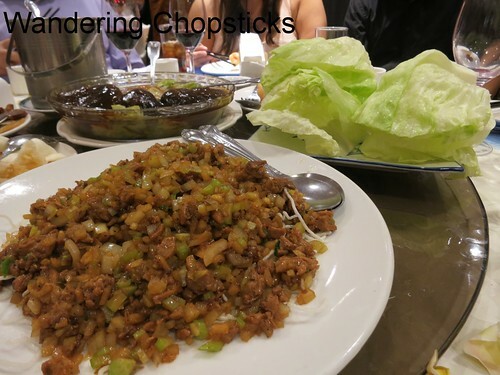 Since only the skin is eaten in a Peking duck wrap, the meat got chopped up and stir-fried for lettuce wraps. Lobster! Long after everyone was tired of picking through the shells to get meat, I attacked the remaining pieces with both hands. Can't waste lobster! 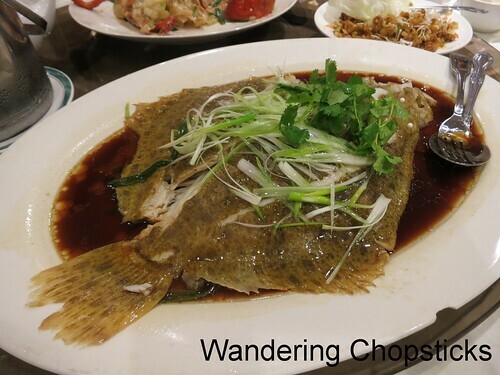 Steamed fish. Very fresh. They were literally swimming in the tanks before being scooped out and steamed for the reception. 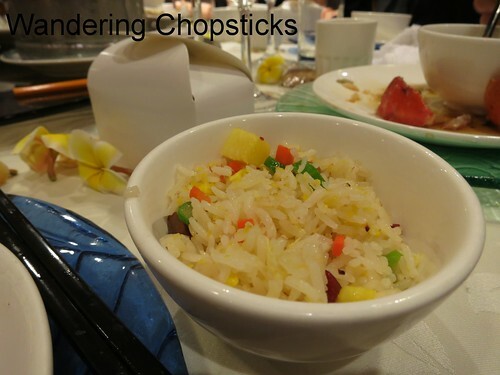 Another Hawaiian touch, pineapple in the Yang Chow Fried Rice. Stuffed! But we still had dessert. 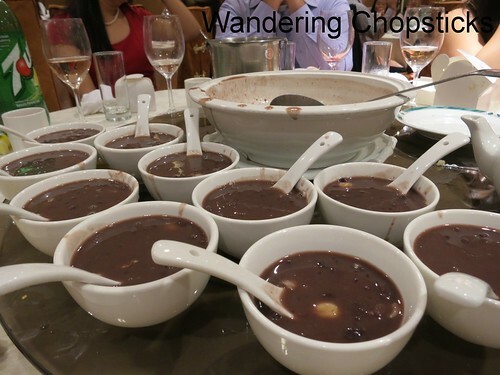 Red bean pudding with lotus seeds. And wedding cake. It was coconut. The groom's uncle (?) 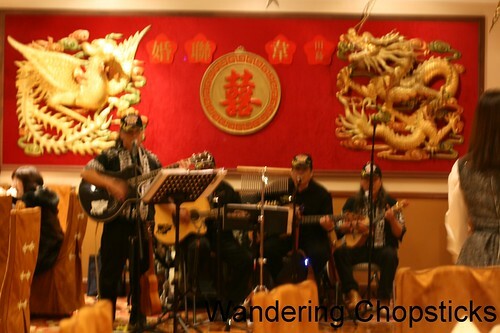 and his band played a bunch of Hawaiian songs. And at one point, several family members did the hula. The guests cheered for the bride and groom to do so as well. 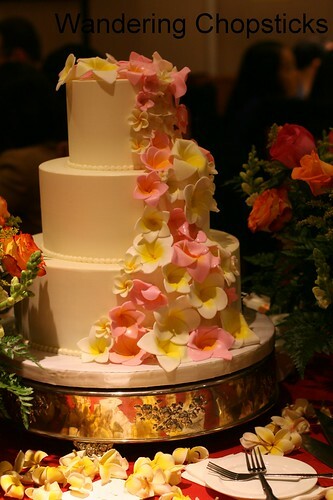 The wedding cake was by Vanille de Patisserie - San Marino. With plumeria blossoms for another Hawaiian touch. 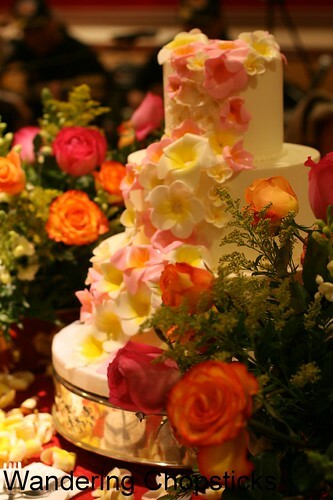 I think the flowers were made of fondant, but I was afraid to get too close to tell for sure. She gave a speech about how, when asked about her dream wedding, she said she just wanted to celebrate with friends and family because she already had her dream man. Awww. My brother's wife gave a pretty entertaining speech telling us all how she was responsible for getting them together. The bride and groom met a dozen years ago while both were studying abroad, but they only got together a few years ago when my sister-in-law insisted that they take a family vacation to Hawaii. That was when her sister and her new husband got a chance to meet up again and started up a romance. And I just had to share this photo of my nephew all dressed up in a tux with a tie and vest and dress shoes and everything. Sooo cute! Can you believe he's almost one? 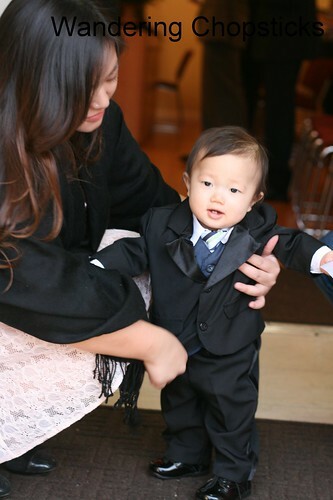 2012 started with his birth and ended with a wedding. Hope it was a great year for all of you! Monday to Friday 10:30 a.m. to 3 p.m. and 5 p.m. to 10 p.m.
Saturday and Sun 10 a.m. to 3 p.m. and 5 p.m. to 10 p.m.
3 years ago today, Xanh Bistro - Fountain Valley (Little Saigon). 4 years ago today, Sichuan Green Beans. 5 years ago today, I ate what? 2007 eating out round-up. 6 years ago today, Sirens Valley wine caves in Hungary. Wow, everything looked so good, and beautiful. I can't believe how much food was served at that party! Such joy and happiness! 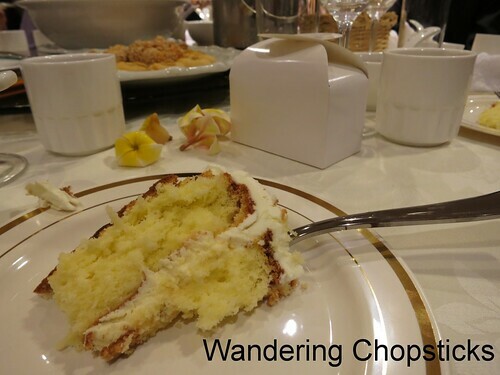 :) I love reading about wedding banquets and seeing the food, the beautiful cake and centerpieces and all. Very nice! Happy New Year to you WC! I know! So many courses. I love wedding banquets. Who doesn't love weddings? Happy New Year to you and the family! Looks like a great time WC! Happy New Year to you. I had a nice smile when I saw the cookies from Honolulu Cookie Company, it's oneof my standard "omiyagi" items. Those cookies were sooo yummy! How have I never stumbled upon them before? I've gotten chocolate-covered macadamia nuts, but never these cookies. So yum! Hi! So I'm not Vietnamese but my fiance is. How much of this menu would also translate to a Vietnamese wedding reception (it seems there's some overlap from what I've read) and what is the significance of the dishes? If you were doing a vietnamese wedding menu, what would it be (recipes included!) My other quandary is how I find something that satisfies my southern and pa dutch German Irish meat and potatoes family while giving a solid nod to my fiance's (vegan) vietnamese family. Thanks so much! 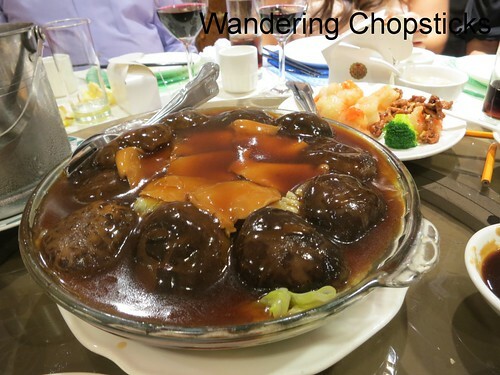 One of my cousins recently had a wedding reception at Mission 261 and his father-in-law is vegetarian, so that whole table was served vegetarian dishes while the rest of us had the usual courses. I think you'd have to do that, otherwise it's too hard to have meat and vegetarian dishes at the same table. One or the other wouldn't have enough to eat. 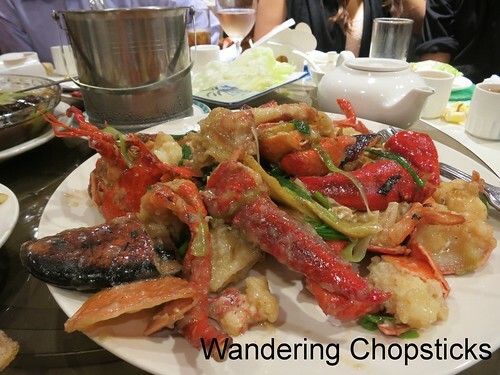 If you read my Hong Kong East Ocean Seafood wedding banquet in Emeryville post, I explain the significance of each dish. Mainly, for marital harmony, the symbols of the dragon and phoenix are represented, respectively, by crab or lobster and chicken or duck. 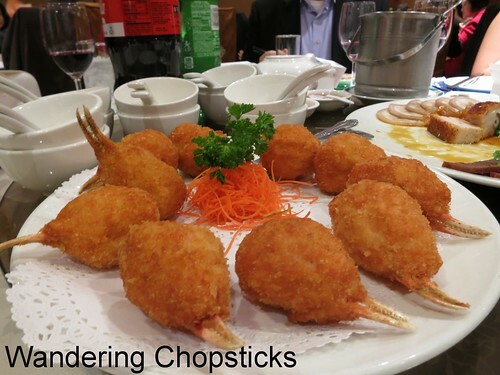 Some Vietnamese or Chinese vegan restaurants can make faux versions of that, but depends on what restaurant you choose. 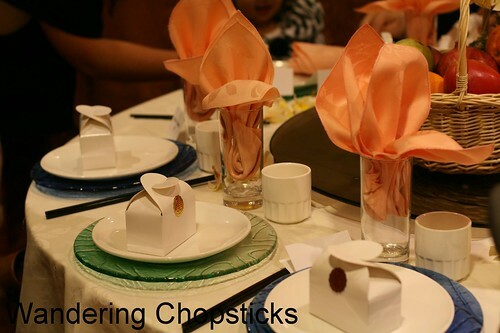 Most of the Chinese dishes are fine for Vietnamese wedding banquets. My third-cousin's reception at Prince Seafood had Vietnamese shaking beef as one of the courses, which I'm sure your meat-loving half would like.